As the mornings get colder and darker it’s easy to find excuses to not get out of bed and continue that summer exercise routine. At Melbourne Osteopathy Sports Injury Centre, our staff have decided to sign up for Premier’s Active April to ensure we keep that summer training momentum going. Premier’s Active April encourages all Victorians to do 30-minutes of physical activity per day during the month. Far too often I hear clients say they don’t have enough time to exercise, but just how much exercise do you actually need to do? Studies suggest that for most healthy adults 30mins of moderate exercise a day is sufficient to gain the benefits of exercise (although if your aim is weight loss then you may need to do more than this). This adds up to only 3.5hrs per week – some people will sit longer than that each week driving to work, or watching TV. Moderate exercise is best described as basic aerobic exercise such as brisk walking, swimming, mowing the lawn or even cleaning the house. An easy way to get your 30-minutes per day is to walk to the train station, park an extra few blocks away from work, or walk an extra block to get your mid morning coffee. It doesn’t even need to be a 30-minute block. You may like to break it up into 3×10-minute breaks throughout the day. You don’t need to be running marathons or pumping weights in the gym for hours on end to see the benefits from gentle exercise. One of the most obvious improvements is likely to be the increase in energy that you experience from simply moving your body. We spend far too long sitting at work, on the train, in front of the computer, on the couch – the more you get up and move the less sluggish you will feel. Exercise also improves your quality of sleep – a better night’s sleep equates to a more productive day at work the following day. And not to mention the mood lift you get from exercise – it doesn’t take a genius to see that when you exercise you get an instant high – that alone should be enough to encourage you to get out and move your body. In addition to taking 30-minutes out of your day for exercise, I always recommend that my desk bound patients stand up and walk around the office every 20-minutes during the day. Simply breaking that routine of sitting poorly or in a static position will do wonders for overall stiffness, neck pain and back pain. Always have a glass of water on your desk and ensure you are drinking a minimum of 2 litres per day – if nothing else this will aid with the regular breaks from your desk! So make April your month to make a change and join the staff at Melbourne Osteopathy Sports Injury Centre in signing up for Active April. Find a friend to train with, download some new songs to your phone or iPod and take a daily break to allow your body to feel the benefits of exercise – I promise you won’t regret it and who knows, you may even want to continue through the winter months! 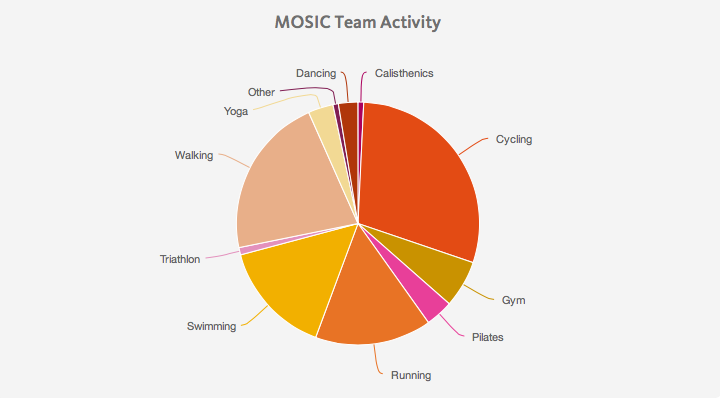 TOTAL FOR MOSIC PRACTITIONERS – 210 hours and 25 minutes – That’s the equivalent to more than 8 days of continuous exercise!!! Well done team!!! April may be over but that doesn’t mean you can’t use this month to make a change and set yourself up for a solid winter of health and well-being. Find a friend to train with, download some new songs to your phone or Ipod and take a break daily to allow your body to feel the benefits of exercise – I promise you won’t regret it.